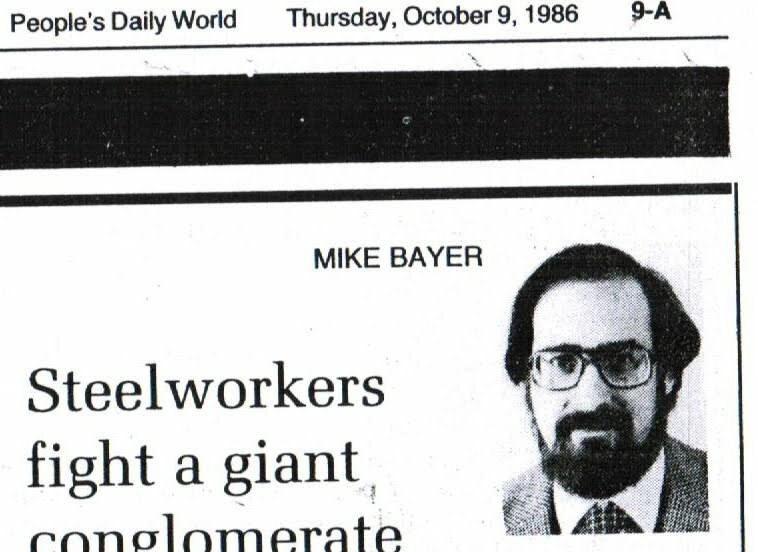 Mike Bayer - Communist Agent in the Bernie Sanders Camp? Independent Vermont Senator Bernie Sanders may have a Communist Party USA agent in his camp. The person in question is Mike Bayer, who is currently serving as Treasurer of Bernie Sanders' Vermont Progressive Party. The Senator from Vermont, is a self proclaimed socialist and proud of it. As a student in Chicago, Sanders was active in the Young Peoples Socialist League and has a decades old relationship with America's largest marxist organization, Democratic Socialists of America. It was in conjunction with D.S.A. that Sanders formed, in 1991, the Congressional Progressive Caucus, now a more than eighty strong alliance of far left Senators and Congressmen. Mike Bayer's closeness to Senator Sanders, however I takes things to a new level. While Bayer is no longer the open communist he once was, there is evidence that he is acting as a spy on Sanders' Party and may be be some kind of liaison man or agent-of-influence for the Communist Party. Bayer has lived in Vermont since 1996, working as Chief Financial Officer of Vermont Legal Aid. He has been a leader in the leftist Vermont Progressive Party, since its earliest days. Currently Bayer is running for the position of State Auditor of Accounts for Vermont, on the Progressive Party ticket. The position is currently held by Republican, Thomas M. Salmon. Before moving to Vermont, Bayer was for many years, Indiana District organizer of the Communist Party USA and a regular contributor to the Party paper Peoples Daily World/ Peoples Weekly World. 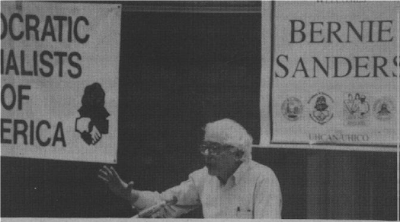 Since working with Sanders' Progressive Party, Bayer has downplayed his communism, but did attend the 2001, Communist Party USA 27th National Convention in Milwaukee. He is almost certainly still a Party member today. Certainly the Party hasn't forgotten Mike Bayer, or the regular updates he provides them on Progressive Party affairs. While the Communist Party works mainly through the Democratic Party, in a few states they will work with influential third parties, which have a real prospect of electoral success. New York's Working Families Party and the Vermont Progressive Party being the best examples. A more advanced aspect of political independence is pro-worker electoral formations outside the Democratic Party. A growing example is the Working Families Party, which has established itself in New York, doubled its vote in two years time, and is now expanding into Connecticut and other states. Election law in Connecticut does not allow petitioning candidates to run on more than one line, so the tactic is to run as many as 60 candidates for State Representative around the state with the goal of getting at least one percent of the vote and winning minor party status in those districts. Then in the next election, the Working Families Party can cross-endorse candidates in other Parties who adopt the Working Families program. Western Connecticut Labor Council president Blair Bertaccini will be one of those candidates. In Vermont, going beyond Bernie Sanders, is the new Vermont Progressive Party, which received 10% of the vote for governor and won 4 representatives in the last election. Mike Bayer sits on their state committee. Blair Bertaccini, incidentally, is a long time Communist Party USA member, who has been less vocal about his Marxism-Leninism, since becoming active in the W.F.P. The Progressive Party in Vermont ran Anthony Polina for Lieutenant Governor. He got 25% of the vote, up from 9.5% two years ago. He campaigned for a tax surcharge on the wealthy, replacing property taxes with broad-based taxes to fund public education, and a single payer health care system. He was endorsed by the Vermont AFL-CIO. The campaign was a collaborative effort with Bernie Sanders and inspired a high voter turnout. Mike Bayer reports that the lack of program by the Democratic candidates for Governor and Lieutenant Governor led to their defeat. Note that Mike Bayer is reporting on V.P.P. affairs back to the highest body of the Communist Party USA. On December 3 2006, People’s Weekly World readers celebrating the results of the Nov. 7 elections, with banquets and dinners in various places across the country. Michael Bayer, treasurer of the Vermont Progressive Party, spoke about left Independent Bernie Sanders’ election to the U.S. Senate as a fighter for working-class people. Bayer also stressed the continuing need to pressure Congress for universal health care, minimum wage increases, the right to belong to a union and the return of U.S. troops home from Iraq. Special guest Michael Bayer, state treasurer of Vermont’s Progressive Party, will address “Building Independent Political Action on behalf of Working Families.” The Progressive Party was inspired by Congressman Bernie Sanders, who is a founder of the Congressional Progressive Caucus and is newly elected U.S. Senator from Vermont. The event will celebrate a year of activism against the war in Iraq and for immigrant rights and workers’ rights, reflected in major get out the vote efforts by labor and community groups which changed control of Congress. Projections will be made for next steps to change the direction of the country and achieve an end to the war, good jobs and health care. The program, to be held at the New Haven People’s Center, 37 Howe Street, will include poetry, music, an international holiday gift table and a home-cooked light supper. The annual reception is hosted by the People’s Weekly World in Connecticut on the occasion of the 87th anniversary of the Communist Party USA. Clearly Mike Bayer is interested in more than reporting on Bernie Sanders' people to the Communist Party. Bayer is interested in policy. "universal health care, minimum wage increases, the right to belong to a union and the return of U.S. troops home from Iraq." This is all Communist Party policy. It is also largely V.P.P. policy. Is Mike Bayer's main responsibility inside the V.P.P. to ensure that the "Communist Party line" is adhered to? Is it also to make sure that Bernie Sanders also pushes the appropriate "line" in the U.S. Senate and through the Congressional Progressive Caucus? This is a key point. Modern American communism, is not about atom bomb spies, terrorists or bomb throwers. It is about achieving "social change" by getting the Democrats to adopt communist policies and selling them as their own to the American voter. Revolution, by stealth, using the Democrats, Working Families Party and Vermont Progressive Party to promote communist programs, is the modern face of U.S. Marxism-Leninism. Mike Bayer is ideally placed to assist with this process. Does Bernie Sanders realize that he is working closely with a probable agent of the Communist Party USA? Its very hard to believe he doesn't. 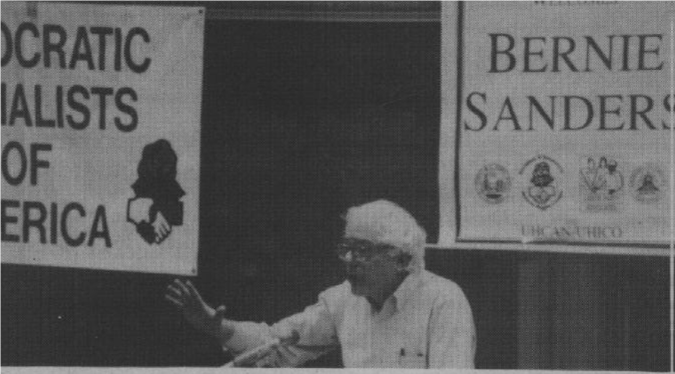 In November 1989 Sanders addressed the 10th national conference of the Communist Party front U.S. Peace Council - "End The Cold War Fund Human Needs" - in Boston, Massachusetts. In 1997, Sanders co-sponsored H.R. 950, the Job Creation and Infrastructure Restoration Act. This Bill was introduced at the request of the National Labor Coalition for Public Works Jobs - which was led by members, or supporters of the Communist Party USA. The Communist Party USA has strong ties to China, Cuba and other hostile powers. Is it of concern that a long time senior cadre of that Party is working in close proximity to a serving U.S. Senator? Interesting article with good information. I have some other verifiable information via the following site. FACT CHECK: Socialists in the United States Congress? "Bad Faith at Ground Zero"